The real time video is paused. The video above is recorded from 7:00 PM to 8:00 PM at the night of Jan 21, 2003. It is a pity that the video recorded from 11:30 to 12:10 PM was lost. At that time, fireworks are everywhere from my window. Happy Chinese New Year! At the night of Chinese New Year, fireworks will be on show all of the city. I have setup a webcam to broadcast the exciting time to the world. :-D The window above is in real time with about 30 seconds delay. Happy New Year! From 11:00 to 12:30, the real time broadcasting successfully completed. Video clips and pictures will be available soon. Happy New Year! Video of my webcam is displayed on my phone in real time. There is serveral seconds delay between the encoder and the player. © Jian Shuo Wang. I broadcasted the scene of my cubicle and use a smart phone to view it, in video, at real time. I can pull my mobile phone and see what is going on, no matter where I am, on bus, in Metro, at airport, in Beijing or in Hainan…. The Windows Media Encoder pushes the video stream from inside the firewall onto a Windows Media Server on public network. 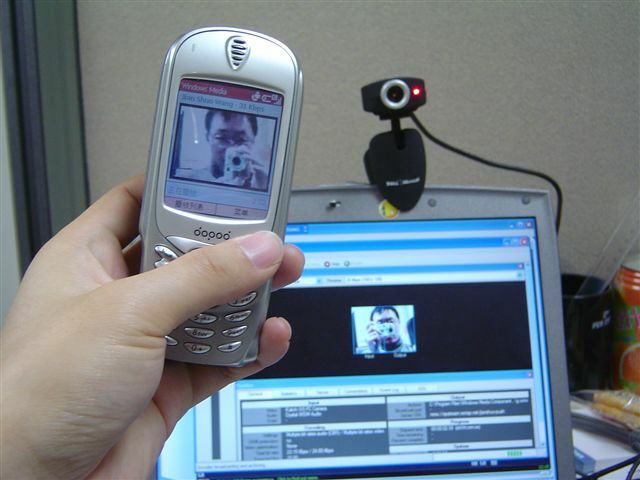 The SmartPhone Dopod 515 displays video using its Windows Media Player via GPRS. Firstly, read this article Real-Time Stream Broadcasting Cookbook and setup your Real-Time Stream Broadcasting station. The result is, you can view your webcam from any other computer from the public. Secondly, visit the URL in your smartphone use your Windows Media Player. The Windows Media Play should behaves the same as the desktop Windows. The first problem in this experient is, the webcam is within the firewall and I have no permission to configure to the firewall. So I need to let users outside the firewall be able to see the video inside. The solution is to find a Windows Media Server on the public website. The Windows Media Encoder can PUSH the video to a publishing point at Windows Media Server. The HTTP connection is initiated by the encoder, so it can go out of the proxy. The client can directly access the Windows Media Server. From May 19 to May 23, the camera will be offline from 00:00 AM to 7:00 PM (most of the day time). It will probably online from 7:00 PM (or 8:00 PM) to 11:00 PM. From May 24, it will extend to day time and aiming to be 50% of the time (12 hours everyday). From June 1, I hope I can operate it 24 hours a day. The tag above indicate the status of the server (online or offline). On May 23, my 130 RMB for all-you-can-eat package take effects. So I don’t have to pay for every minute my server is online. By June 1, I should have a dedicated server for this service. You are watching Shanghai in real-time. I am very happy that I have the passion to setup this Shanghai webcam again. Through this webcam, you can see part of the Shanghai – at the intersection of Cao Bao Road and Xi Qin Road in Southwest Shanghai. The camera is placed at the south window of my apartment, directing to the outside. The high building on the left is the Shanghai Everbright Exhibition Center. There is a 4-star hotel and some office buildings in this thirty story huge building. On the right, the lower building with a blue arch is the Shanghai Everbright Convention and Exhibition Center. It is one of the three major exhibition venue in Shanghai. Typically, the exhibition center’s schedule is completely full until end of 2004, according to news sources. However, as you can see from the video, it is closed. All exhibition from the end of April is canceled. You can also see the road between the exhibition center(right) and the office building (left). It is called Xi Qin Road. The traffic is low. In the distance are some residential buildings which were just built 2 years ago. You can frequently check this page – in the morning, in the afternoon or in the evening; when it is sunny, cloudy or rainy. At different time and condition, you will see the different sceen of Shanghai. If you have a website or personal homepage, why not put this webcam into your own page? Just insert the following HTML code to your webpage. The webcam and the broadcasting server is hosted in my house. You can easily open a small window on your computer desktop and see Shanghai in real time through the window. Sounds cool? Here is how you can do it. Requirements: You must use Windows XP. Right click on the blank area of your desktop and click Properties on the pop up menu. Enter “http://home.wangjianshuo.com/archives/2003/05/18/ShanghaiWebCam.htm” in the Location text box and click OK.
Clic OK again when asked “Add to Active Desktop (TM)”. Click OK twice to complete the setup. You will see the webcam appear on your desktop. You can adjust the size of the window to just fit the Windows Media Player. Why not create your own webcam and broadcast your window scene like this? The only thing you need is a computer, a broadband network connection and a webcam. I have wrote about Real-Time Stream Broadcasting Cookbook. Hope it helps. The only limit if your imagination. A dedicated computer as the media server. Space – the USB wires and the webcam actually messed up my neat window. I will setup a watch dog to report on the online time of this service – may publish a schedule for the “show-time”. Check the status of the media server here. If it shows “Shanghai Webcam Server is Offline”, it means I have turned it off to save bandwidth, save electricity and avoid the noise of the computer fan. Daily visitors to this cam are less than 20. I don’t want to be silly to operate something the world don’t care. I cannot cover my cost – if I need the computer and I don’t have any spare computer. My wife cannot bear the noise and the wire one day – yes. I will defintely remove the webcam from window area. To keep the traffic of this page. Send the URL of this page to your friends or link it up in your website. Recommend this page in BBS and forums. I want to find a dedicated computer to be the server since I cannot garentee the availability of the server if I also play game on it. Now I have alread got a hard disk, a motherboard, a CPU fan, a display adaptor. If anyone has used (as long as it works): CPU, memory, computer case, power unite, network adaptor card, please comments below to let me know. I can pay some money for it. Please use the comment system to let me know whether you can see the video. Report to me if you cannot see anything. Below are the sample views. 2003.05.19 at 10:35 PM with very poor light condition. This service is paused after I moved my house to Pudong. Please wait for further notification of the status of this service. As I promised before, I will share with the steps to set up a webcam to broadcast real time video with Windows Media Encoder in this article. There are two part of this article. The first part is the client side configuration. Please make you check you can view the content of my webcam from your Windows client. A simple troubleshooting guide is included. The second part is the server side configuration. I will guide you to setup the hardware and software on the server side, so you can broadcast what your webcam captures to the whole world. Your experience will depend on the operating system you are using. Windows XP. You should not encounter with any problem if you are using Windows XP, since it includes Windows Media Player Windows Media Player 8.0. Windows 2000. If you are using Windows 2000, which includes Windows Media 7.1, you will be prompted to install Windows Media 8.0 codec. Choose Yes if you want to continue to view. Windows 98, Windows 95 I haven’t tried yet, but it should be more complex to get it work. It includes Windows Media Player 6.4 by default. Mac. If you cannot view it, try download Windows Media Player for Mac OS X. To be honest, I haven’t tried to view my broadcasting on a Mac computer now. Solaris Download Windows Media Player 6.3 for Solaris. I was working of Solaris when I was in Tele cooperation Lab when I was a senior in SJTU. But I believe not so many people is using Solaris now, especially for viewing online media. I am using broadband in my home. You should also use a high speed connection. I have tested it from different locations around China. It works very good for both broadband connection or T1. My friend Bill Lum also told me that he can view the video smoothly in San Francisco. For modem dial-up, maybe you can only see black window, with “buffering” always there on status bar. Try a faster connection. If you see Ready in status bar but the video does not come out, it means there is a connection problem, or the Windows Media Encoder is not running on my server side. If you can only see stable Buffering, it must be a speed problem. Well. After addressing the client side requirements and troubleshooting steps, let’s take a look at the server side. A normal computer that can run Windows XP is fine. Mine is a Intel Celeron 440, 256M Memory. Pretty low configured, isn’t it? I am using Windows XP. Windows 2000 will also do. Any webcam should be fine. I am using Samsung Anycam. The only annoying thing I met was, Windows does not natively support it, so I need to download driver separately for it. Broadcasting from home does not need a Windows Media Server, the only software you need is Windows Media Encoder. It is FREE. You can download the latest version from Microsoft web site. Download Windows Media Encoder (9 MB) first. Installation the Windows Media 9 Series is as easy as installing any other Microsoft product, even easier. Click Next forth and click the Finish button will do the work. The only additional step you need to go is choosing “I agree” at the End User License Agreement page. Select “Broadcast a live event…” since you are not broadcasting a piece of video you have recorded. Select the camera in Video source. You can select your Audio source too, but don’t expect the sound effect is good. You can use a .WAV file as background music. HTTP port. Just leave it as it was — 8080. Change it if you have to. Always select Pull instead of Push, since you don’t have Windows Media Server. For profile selection, you can try different profile that meet your needs. The common rule is, the higher the resolution is, the more bandwidth it requires. I am using 320×240 in size, 15 fps, and on 100 kbps. Think carefully when entering Title and Author, it will be displayed on the viewer’s media player. Finally, do NOT select save the video to file unless the video is really important or you have enough disk space. After everything is done, click “Start Encoding”. Congratulations. The server part is done. How about the client then? Substitute the source with your server name and the port you chose. If you can see the video, you can go ahead to create a web page so others can directly view it on a web page as I did. You can copy the source code of my page into your page. You are free to do so and you don’t need to link back since I got the source code from MSDN sample. If you have successfully setup your own Windows Media server and can broadcast to the Internet, I will congratulate you on the achievement. I will feel very happy for the 1.5 hour I have spent on this article. My only requirement for you is to write a comment under this article and share the URL of your online broadcasting station with my readers. It may also be common. Write a comment under this article so all the community members, including me, can help you on that. I have setup a webcam, broadcasting the street scene from my window in Shanghai. Update: The steps are available here. I am going to improve the camera so that it can be viewed by many people. Now, as far as I know, it should work fine on Windows XP. It may also work on Windows 2000 with Windows Media 7.0 or higher. I cannot garentee you can see it if you are using older version of Windows. Please let me know if you can view online broadcasting or not. Simple click the comments link below. Tell me, “I can see the cars and people moving on the street. My system is … ” or “I can see nothing, except the blank Windows Media Player and Ready on the status bar. My system is …” Thanks.